Edit: Extreme care needs to be taken when reading this post as it was written (and apart this bit, it has not been modified) before the introduction of the Road Safety Amendment (Hoon Driving and Other Matters) Bill 2011. To see how we think the new legislation might operate see this more recent post, but always read the Act for yourself. The last session of Parliament saw the introduction of two principal amending acts for the Road Safety Act 1986. The Road Safety Amendment (Hoon Driving) Act 2010 passed last week. The substantive parts of the Act will come into effect on 1 July 2011 unless proclaimed earlier. The Act is here. The Explanatory Memorandum here. The Second Reading speech is here and the Statement of Compatibility here. Care needs to be taken when reading the EM. Amendments to impoundment periods (from 7 days to 14 days for immediate impoundment, and 28 days to 45 days for court-imposed impoundment) were circulated and adopted after the Explanatory Memorandum was published. Provisions increase the number of offences covered under the hoon system (to include offences like drink-driving and unlicensed driving), extend the immediate impoundment period, create mandatory impoundment periods the court must impose (on the application of the police, unless very limited circumstances apply), increase penalties for speeding and licensing offences, and require operators of vehicles to answer questions about the location of their vehicle. driving while disqualified (for a second or subsequent time). A full list of current relevant offences is found at s 84C. Now, a first offence may result in the impoundment or immobilisation of a vehicle for 48 hours. A second offence may, in addition to an initial 48 hour impoundment or immobilisation, result in a further court imposed impoundment or immobilisation sanction of up to three months in total. A third offence can, in addition to an initial 48 hour sanction, result in the court ordering the forfeiture of the vehicle. The immediate impoundment period for vehicles is being increased from 48 hours to 14 days for all relevant offences. Relevant offences will be grouped into two tiers. (i) an offence against rule 297 of the Road Rules in circumstances involving improper use of motor vehicle. In all cases where a person appears before the court for an offence for which a three-month impoundment or immobilisation sanction may be imposed, the court will be required, upon a finding of guilt and upon the application of the police, to impose a vehicle impoundment or immobilisation sanction for at least 45 days. There are exceptions, but the Court's discretion to refuse applications will be narrower than under the earlier provisions. Where an offence of exceeding the speed limit by 70 km/h or more (or 170 km/h in an 110 km/h zone) is detected, the driver may be liable to an application to impound the vehicle for three months on the first such offence, as well as the immediate 14-day impoundment. For a second such offence, application for forfeiture of the vehicle may be made. Offences under s 30 were treated less severely than other relevant offences. Under the amendments, a second offence may result in up to three months vehicle impoundment or immobilisation and a third offence may result in forfeiture of the vehicle. The offence of driving unlicensed for a second or subsequent time will also become subject to the vehicle impoundment scheme. Adults may be questioned about the location of vehicles subject to the hoon provisions, and refusal or a failure to provide relevant information may be an offence. The proposed measure has become necessary because police have repeatedly been frustrated by offenders who deliberately conceal the location of relevant vehicles to prevent the imposition of immobilisation, impoundment and forfeiture sanctions. There are no less restrictive means of achieving the stated purpose. This provision will probably be subject to challenge in future. Its potential for abuse seems clear. The addition of offences under s 18 and s 30 needs to be read in conjunction with the provisions of the Sentencing Amendment Act 2010 that remove mandatory imprisonment for a second offence of driving while suspended or disqualified (of which, more soon). The legislature have recognised that the threat of gaol does not deter a significant number of people without a licence from getting behind the wheel. It's obviously thought that the seizure of their cars might be more effective. This will work on Chapel Street bogans who don't like seeing their pride-and-joy dragged away on a flat bed trailer. But like all ideas dreamed up in Spring Street this isn't the solution it is being claimed as. If Lightning McQueen didn't care about the risk of jail before there isn't anything stopping him from pinching a car everytime he gets stuck in the city after midnight without a ride home. Or slapping bald tyres and some plates on the old bomb that's been up on blocks in the backyard since last time he pranged it. A hoon in a stolen or unroadworthy car isn't a big improvement on what we've got now. The new section 84GB probably won't cause as many problems as you suggest. I agree that there is potential for abuse by creative investigators, but the legislators have built in some sensible safeguards for a change. The information has to be sought for the "sole" purpose of locating and impounding the vehicle. The penalty is five hundred bucks so it's unlikely anybody with a dead body in the boot is going to have to think hard about what to do in that situation. There's no power of arrest. If your concerns are to do with derivative evidence I think that's been pretty comprehensively dealt with in the "re Major Crime" case. Even if not the Evidence Act discretions at 135 and 138 have probably got it covered. If there were problems with 84GB then the whole of section 60 of the RSA has got real problems. It probably won't even be challenged under the Charter. As we all know now, a declaration of inconsistency may look pretty hanging on the wall but it doesn't keep you warm at night. 84GB(4) expressly provides for derivative use immunity. Dr Man, it's not an 'offence', but rather a 'suspected offence' that may result in immediate impoundment. The government said in its 2R speech that it wanted 7 days (rather than 2) so that (suspected) 'hoons' couldn't hide the impoundment on their families and would have to endure the agony of public transport SARC said that that sounded like punishment and reported that the change 'may be incompatible with' the Charter's presumption of innocence. The opposition and greens originally changed the period to 30 days (with the greens disagreeing with SARC's charter analysis, branding it a 'right to a car'.) The government initially responded in the LC by arguing that the increased period would be incompatible with the Charter. In the LA, it switched its argument to the shortage of warehouses and brokered the 14 day compromise. All that does raise the prospect of an action for a Charter declaration. (4)'s not as protective as it looks. If Constable Plod rocks up on the doorstep of the registered operator after a car accident looking for them he can demand the location of the car (if he reasonably suspects the vehicle was involved in a relevant offence, of course) from anyone who answers the door. The evidence can't be used against that person (Mum, flatmate, whoever.) (4) doesn't say it can't be used against anyone, like the driver of the car. The government seems to be having a spot of bother with their Revenue Collectors (and I don't mean the ATO). "The problem was identified after police served a notice to surrender to a driver who had been photographed on 24th September this year." 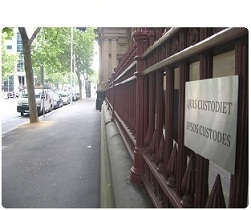 This refers to the "hoon laws" used to seize and impound people's cars for speeding. I like to think of a couple of boys in blue and the tow truck around at the innocent punter's house, about to attach the hook-hoist to ... a VW Beetle? A scooter? Maybe one of Lindsay Fox's fleet with a hermetcially sealed speed governor attached to it? Or Simon Overland's car? "Uh, Sarge. I think we've got a bit of a problem down here ..."